Is bicycle touring Thailand right for you? Find out below! If you’re thinking of bike touring Thailand, we say, great idea. Thailand has it all: welcoming people, smooth roads, gorgeous beaches, and tempting food on every corner (literally). Read on to find out if cycle touring Thailand is right for you. What’s in our guide to bike touring Thailand? We’ve bike toured in 22 countries around the world, including Thailand on three separate occasions. We first entered Thailand in the north, crossing the border from Laos into Chiang Khong and then travelling southwest through Chiang Rai, past The White Temple, and towards Chiang Mai. From Chiang Mai, we veered south, enjoying Thailand’s little-visited middle bits. We stopped in Ayutthaya, just short of Bangkok, where we headed off on a Cambodian cycling adventure. After Cambodia, we returned to bike Thailand along the south coast. From the southern beaches, we turned north and entered Bangkok by bike. Quite an experience! Thailand’s south coast has empty beaches that tourists often miss. Though we skipped Thailand’s southern peninsula on our worldwide bike tour, we recently returned to cycle from Bangkok to Phuket on an amazing Grasshopper Adventures Self-Guided Bike Tour. We loved visiting the ancient temples and sparkly modern wats, couldn’t get enough of pedalling the backroads, and ending every day gazing out at incredible views wasn’t so bad either. Is Bike Touring Thailand Right for You? Watch the video for a quick peek into what it’s really like to bicycle tour in Thailand. This is from our 10-day self-guided tour with Grasshopper Adventures. Thai people are obsessed (and I mean OBSESSED) with food. I’ll be the first to admit I spend an inordinate amount of time thinking about, cooking, and eating food — but compared to the typical Thai person, I’m an amateur. Plus, Thai people rarely cook at home, preferring to eat most of their meals at street markets or food stalls. This is great news for cycle tourists in Thailand. Since Thai people are almost always eating, it means there’s plentiful and inexpensive food available everywhere you look. You’ll have your pick of curries, grilled meats, noodles of all descriptions, and mango sticky rice for dessert every day (why not?). The only caveat is that individual Thai dishes tend to be quite small, so you’ll need at least two to satisfy a cycle tourist’s hunger. In Thailand, food is absolutley everywhere! However, vegetarian and vegan cyclists can face a challenge getting fed. Sadly, this abundance of food does not apply if you’re vegan or vegetarian in Thailand. Despite the predominantly Buddhist culture, Thai food is almost all centred around meat — the main event in most dishes. At the Thai cooking class we did in Bangkok, our teacher described vegetables as “decoration”. In non-touristy cities, you can usually find a vegan Buddhist restaurant or two — but it can be a challenge to find out when they are open! Of course, Bangkok and Chiang Mai are saturated with Western vegan options. But, once you get off the beaten track, finding veggie food is always a challenge. There’s a reason Thailand is nicknamed The Land of Smiles. Everywhere you go, you will be welcomed with a beautiful smile and enthusiastic locals. Now, before you get the idea that everyone in Thailand is outrageously happy all the time, know that in Thailand, a smile is sometimes used to hide anger or irritation — so if you’re on the receiving end of an inappropriately timed smile, now you know why. These two friendly souls were serving the only veggie food in town. Our saviours! However, especially when you get off the beaten track, you’ll be met with genuine grins. As a bonus, many Thai people are enthusiastic cyclists, so they will want to know all about your journey and give you any support you need. Thailand is also quite a liberal country, so you will be fine wearing tight bike shorts, tank tops, and whatever else you need to stay cool on the road. When visiting wats, be prepared to cover up. Show respect by covering shoulders and knees before entering. You also need to show appropriate respect to the Thai Royal Family. Pictures of the king are everywhere and you should view them with respect. If the national anthem suddenly begins to play, be prepared to stand in silence for the duration. Just follow the lead of the Thai people around you and you’ll be alright. We didn’t do any camping in Thailand because we had sent our camping equipment home before getting there. That said, there are lots of great camping opportunities in Thailand. Almost all national parks have campgrounds. Even better, most of them allow you to rent tents and camping equipment at the park – perfect if you don’t plan on camping often, but want to try it a few times. We’ve also met a few cycle tourists who spent their nights camping at wats. Wats are ever-present and easy to find and we never heard of anyone being turned away. Unless you’re really intrepid, wild camping is not a great idea in Thailand. For a start, there are people everywhere, so it’s hard to go unnoticed or to find a quiet spot. Then there’s the unknown quotient of wildlife — we saw many pythons and other huge snakes squashed on the road during our Thai bike tour. Do you really want to go bushwhacking off the road knowing that you could step on a python at any moment? The great news is that accommodation in Thailand is plentiful, clean, and cheap. Even in the most remote corners, wherever you cycle in Thailand, you will almost always find an acceptable place to stay the night. On the outskirts of most towns in the north, we found mini resorts which were a collection of little cabins usually centred around a swimming pool. Ideal accommodation for hot and sweaty cycle tourists. If you’re staying in Bangkok for a few nights and want to splurge, we highly recommend Volve Hotel. Just make sure to check ahead to see if they are OK with you bringing your bikes inside! On the southern peninsula, we loved Anurak Community Lodge, a great place in the middle of the jungle not far from Surat Thani. 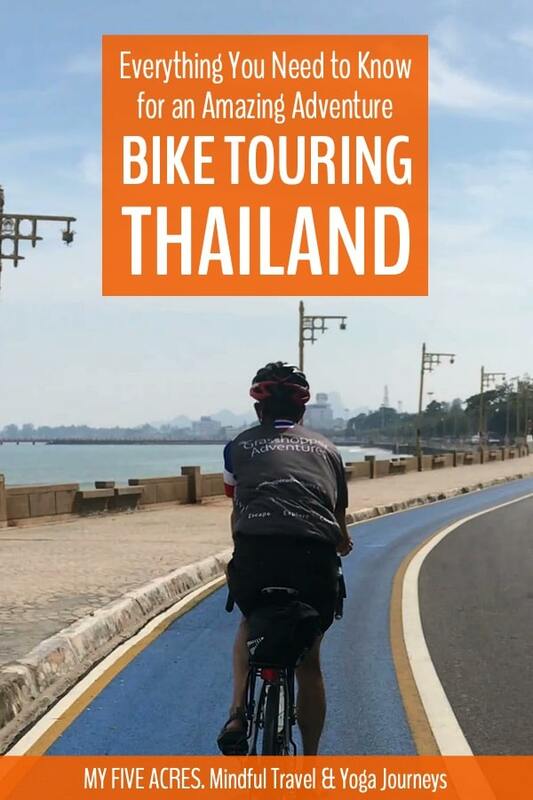 If you opt for self-guided cycle tour of Thailand with Grasshopper Adventures, they book all your accommodation ahead of time, so all you have to do is pedal the bike! Many cycle tourists rave about Thailand as a bike touring destination. That’s partly because Thai roads are very well maintained compared to other countries in Southeast Asia. Where Cambodia and Laos have bumpy red dirt tracks or pothole-ridden asphalt, Thailand has endless miles of perfect smooth blacktop. But alas, with well maintained roads comes plentiful traffic. Thai drivers love to go fast! If you end up on a main road in Thailand, which is sometimes unavoidable, prepare for hundreds of pickups careening by your elbow at top speeds. Plan your routes to avoid the main arteries when you can. When you can’t, just put your head down and pedal. Another irritating quirk of Thai roads is that they often have a median down the middle, complete with a fence or barrier that is too high to lift a fully loaded bike over. At times, you’ll have to ride several kilometres in the wrong direction until you can find a place to turn around. The other option is to ride the wrong direction in the shoulder of the road. Thai motorcyclists do this all the time, so when you’re riding the right way, you’ll have motorcyclists come at you head-on. It can be highly irritating and sometimes dangerous! Of course, Thailand also has its share of back roads which will take you through palm groves, rice fields, coconut groves, and some of the best landscapes you’ve even seen. It is on roads like these that all our most magical Thailand cycle touring moments happened. Aside from the crazy traffic, there are not many serious dangers when cycling touring Thailand. There is a small risk of being pickpocketed or robbed, but it is lower than it would be in most European countries. Scams are more common, especially if you visit extremely touristy areas and are trying to take a tuk tuk or taxi. One of the great things about cycle touring is that you tend to avoid these tourist dangers, since you’ll often be off the beaten track. The main dangers for cycle tourists in Thailand come from animals. Thailand has a LOT of stray dogs. They gather in packs along the roadsides and roam the alleyways. Usually, these dogs are a tired, lazy bunch, who will barely lift their heads as you cycle by. In fact, despite seeing thousands of flea-bitten curs in our weeks of cycling Thailand, we’ve rarely had a dog incident there. Most dogs in Thailand are of the friendly, lazy variety — but there are some that will chase you, too! Any problems with dogs comes from guard dogs. Many Thai farms and homes keep a dog or two out front, trained to bark and growl at passersby. Occasionally, these dogs take their duties a little too seriously and come out to the road to give chase. When this happens, my heart always leaps to my throat, but they usually give up before the make contact. There is rabies in Thailand (and there was an outbreak in early 2018), so if you do get bitten by a dog, make sure to get medical attention as soon as you can. Though we tend to think of them as just a nuisance, mosquito bites are the most deadly thing I’ve ever encountered while travelling. After I contracted malaria in Laos (cured in Thailand) and dengue fever in Bali and southern Thailand, I can attest to the danger of a stray mosquito bite at the wrong time. Malaria is only prevalent in the region of Thailand that directly borders Myanmar, so if you’re planning on cycling there, bring anti-malarial drugs and take them! For the rest of the country, wear repellent every day, especially in populous areas, to prevent getting dengue. Though dengue is unlikely to kill you (unless you ignore the symptoms entirely and keep cycling), it can knock you flat for a week or two, which will put a major damper on your Thailand cycle tour! Please don’t feed them, since they are wild animals and fully capable of getting their own food — and we don’t want to make them reliant on humans. In touristy areas, like Lopburi, you need to be more cautious about monkeys. They are used to humans and will try to steal your water bottles, snacks, and anything else shiny you might have on you. Tame monkeys can be very curious about fully loaded bicycles, so if you’re parking somewhere monkey-heavy, keep an eye on your bike. The monkeys OWN Lopburi and they can be annoying and aggressive. The main danger comes from monkeys who are not scared of humans. Never feed them, tease them, or engage with them. If one does jump up on you, stay calm. Just tilt your arm or shoulder towards the ground until the monkey hops down. If you get bitten, seek medical help right away, because monkeys can carry rabies, too. As cycle tourists, we are more likely to go wandering off into grassy areas and overgrown areas. In Thailand, that can be a very bad idea! The number of squished pythons we’ve seen on the roadside has definitely made us think twice about stomping around in the undergrowth. Thailand also has other venomous snakes, poisonous spiders, scorpions, and centipedes. So do your self a favour and don’t wander off into the bush! As if all those scary land animals aren’t enough, Thailand has jellyfish, too. They’re more likely to be present during overcast weather or after a storm, so keep an eye out. If you get stung badly, it’s time to head to the hospital! Thailand is one of those countries where travel budgets fluctuate wildly depending on where you choose to eat, sleep, and drink, and what activities you choose. If you stay in cheap guest houses or hostels and eat mostly at night markets or street stalls, you can keep your budget down to around $35–45 per couple. Choosing slightly more comfortable accommodation and eating in restaurants, you’ll need around $50–75 per day per couple. As with most cycle touring destinations, prices in rural Thailand are much cheaper than those in the popular beach areas or islands. Here are a few tips for packing for bike touring Thailand. You really only need one pair of shoes. We used our Keen sandals for cycling and casual wear. It’s almost always hot, so you probably don’t need any warm clothes. Thailand has incredible beaches and beautiful swimming pools. Don’t forget your swimsuit. A sarong is handy for covering your legs when you want to visit a wat or temple. It can be rainy in Thailand, so bring a breathable rain jacket. Stephen loves his Showers Pass jacket. Bug spray and sunscreen are both vital — you can easily buy both in Thailand. This cool little Zap-It! bug bite zapper is a lifesaver if you do get bitten! It gets rid of the itch and the bite disappers quickly. For our first and second cycle tours in Thailand, we cycled independently, carrying our own gear on our Surly Long-Haul Truckers. But the third time we came to Thailand, we had the luxury of doing a self-guided cycle tour of Thailand with Grasshopper Adventures. You cycle independently, so you have all the freedom of a unsupported cycle tour. Grasshopper provides all the bikes and gear when you get to Thailand, so you don’t need to spend piles of cash and time prepping for your trip. Grasshopper has ridden and researched the routes ahead of time, which will keep you off those crazy Thai highways as much as possible and help you find the hidden gems along the way. They also book all your accommodation, so when you get to your destination, all you need to do is check in (and go for a swim). On a self-guided cycle tour, your luggage is transferred from place to place, so you only need to carry whatever you need for the day — that means you can do a cycle tour even if you’re not in tip-top shape! We cycled from Bangkok to Phuket with Grasshopper and had a great time. If you’re new to cycle touring or you want to cycle Thailand as part of a longer trip, we highly recommend it. On our self-guided bike tour of Thailand, we saw views like this almost every day. 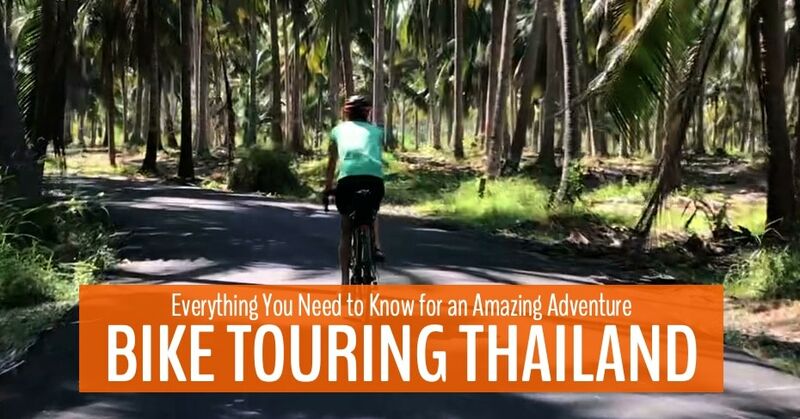 If you prefer to go on a guided bike tour of Thailand, we recommend checking out the tours below. Having a guide with you is like getting a backstage pass to the country. This is the same route we did on our self-guided cycle tour of Thailand but this one is with a guide. It starts in Bangkok and after a short train ride, you’ll be out on two wheels, exploring deserted backroads through coconut groves and cruising along stunning beaches. You then head inland to cross to the Andaman Coast, where you’ll have a few more days of stunning scenery before ending in Phuket. Experience the wilds of northern Thailand on this cycle tour that starts in Chiang Rai. Explore stunning rural mountain communities, impressive Buddhist landmarks, and, of course, incredible views, before immersing yourself in the unique food culture of Chiang Mai. For an ultimate Southeast Asia cycling adventure, check out this trip that takes you all the way from Bangkok, through Cambodia, and to Saigon in Vietnam. It’s an epic ride with extra comfortable accommodation, to make it achievable and rewarding for all cyclists. So, is bike touring Thailand right for you? Are you planning a trip soon or just dreaming? Have you cycled Thailand before? Let us know in the comments! Pin this for your Thailand bike touring adventure. Pingback: 15 Reasons to Travel Slowly + 10 Tips on How to Do It! | My Five Acres. Travel. Adventure. Yoga. Pingback: Vegan in Thailand: 15 Tips for Finding Animal-Friendly Food | My Five Acres. Travel. Adventure. Yoga. Pingback: Bangkok Design Hotel: Volve Over-Delivers on Comfort, Quality & Quirky Style [Review] | My Five Acres. Travel. Adventure. Yoga.